April 20th marks 200 days until the 2018 midterm elections, scheduled for November 6, 2018. There will be elections for all 435 House and 35 Senate seats. There will also be 36 gubernatorial races contested that day. 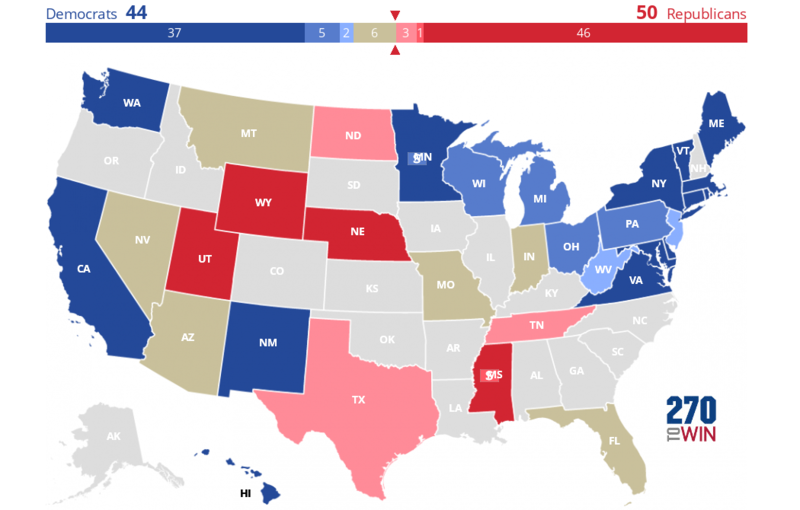 The maps below highlight the races seen as more competitive at this time based on a consensus of forecasts from Sabato's Crystal Ball, The Cook Political Report and Inside Elections. Click/tap any of them for an interactive version. Links to a blank map are also provided. There are currently 237 Republicans and 193 Democrats, with 5 vacancies. A 6th vacancy is forthcoming as Rep. Jim Bridenstine (R, OK-1) was confirmed Thursday to head NASA. One of those vacancies, in Arizona's 8th district, will be filled in a special election on Tuesday. If we assume all the vacancies stay with the incumbent party, Democrats will need to gain 23 seats on November 6th to take control in 2019. There are currently 65 seats rated toss-up or leaning by one or more pundits. Those are shown as tan on the map below. A blank House map is also available. Republicans currently have a 51-49 edge over Democrats, who need to gain two seats to take control in 2019. There are two special elections among the 35 races this year. Eleven seats look to be most competitive, with six of them rated toss-up by all three pundits. These include Republican-held Arizona and Nevada, along with Democratic-held Florida, Indiana, Missouri and North Dakota. Democrats hold 26 of the 35 Senate seats, including five seats that Donald Trump won by 18% or more in 2016. 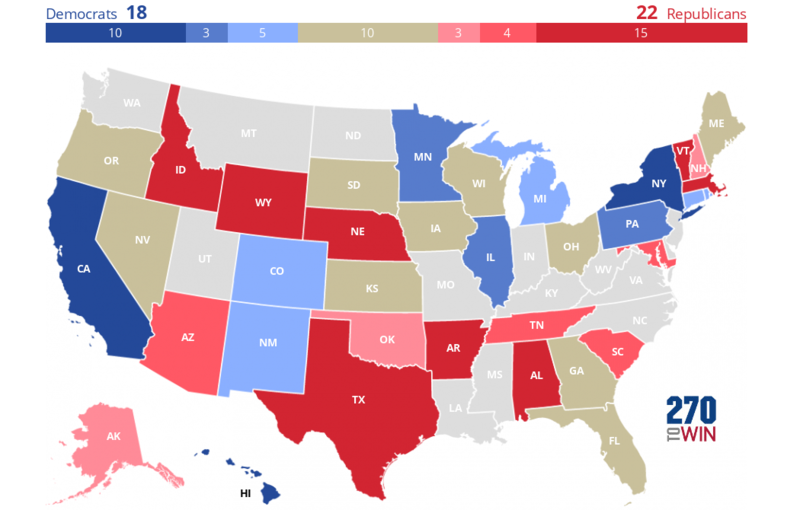 The battleground map is below; a blank Senate map is also available. Republicans sit in 33 of the 50 governors' chairs, while Democrats hold of them. Alaska governor Bill Walker is an independent. 36 seats will be contested in 2018, of which 16 look to be competitive at this point. Most of the governors elected this year will be in office when redistricting occurs after the 2020 Census. As a result, these state races have more national implications than usual. The battleground map is below; a blank gubernatorial map is also available.